Clean and cut the spring onion on a thin layer and put it with oil to stew in a non-stick frying pan. Once softened, add the sieved organic datterini tomatoes with ginger “Il sano” Petti, salt and bake for about 15 minutes. At half-cooking, add part of the olives and of the hand-broken coriander leaves. 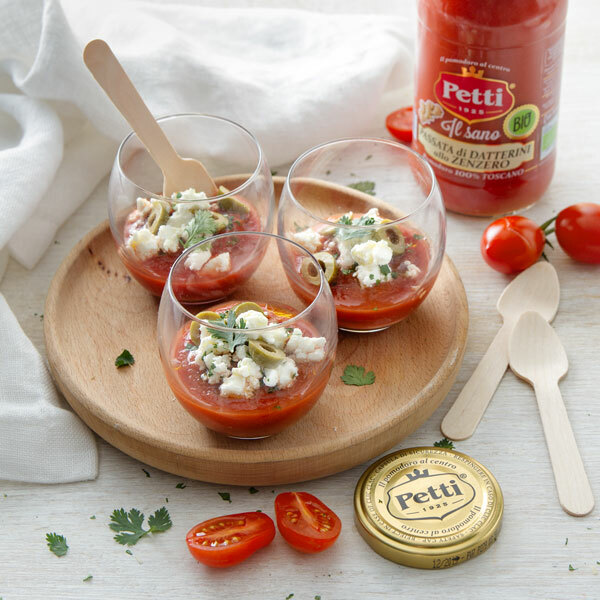 Serve the creamy tomato soup cold in small glasses, garnishing with crumbled Greek feta cheese, the remaining olives and coriander and raw olive oil.